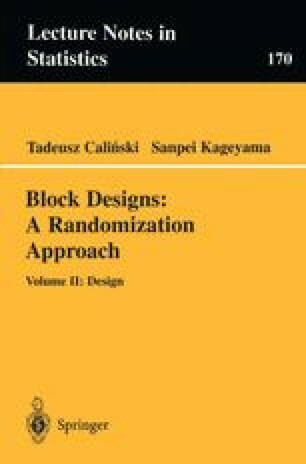 Resolvable block designs, introduced in Section 6.0.3, are important in practice because it is often useful to be able to perform an experiment with replicates one or more at a time. The present chapter is devoted only to those among (α,α2, …,αa)-resolvable block designs which are a-resolvable for α ≥ 1, according to the concepts discussed in Section 6.0.3. A 1-resolvable block design is simply called resolvable in the usual sense of Bose (1942a). Note that α-resolvable block designs are necessarily equireplicate. Now, recalling the general form of Definition 6.0.2, one can write as follows. A block design with parameters v, b, r, kis said to be a-resolvable if the blocks can be separated into a sets (superblocks) of bh blocks each (b=∑ h=1 a b h ) such that the hth superblock contains every treatment exactly a times, for h = 1,2, …,a. Further, note that if the block design is proper, i.e., k = k1b,, then b1 = b2 = … = ba(= b0, say). Then one gets b = b0a, r = αa, vα = kb0 and bα = rb0. An a-resolvable proper block design with parameters v, b, r, k is said to be affine a-resolvable if every two distinct blocks from the same superblock intersect in the same number, q1, of treatments, whereas any two blocks from different superblocks intersect in the same number, q2, of treatments. Here q1 = (α - 1)k/(b0 - 1) and q2 = k2/v (see Section 6.0.3). A more general case can be seen in Definition 6.0.3.